You may not know them, but the Democratic Unionist Party is set to play a huge role in Westminster. Northern Island’s biggest party with ten MP’s seem to be Theresa May’s only hope of holding onto power. In what circumstances, we are yet to find out, but as May makes her way to the Palace to ask for the Queen’s permission to form a government, here is what Twitter thinks of a possible Conservative/DUP coalition. 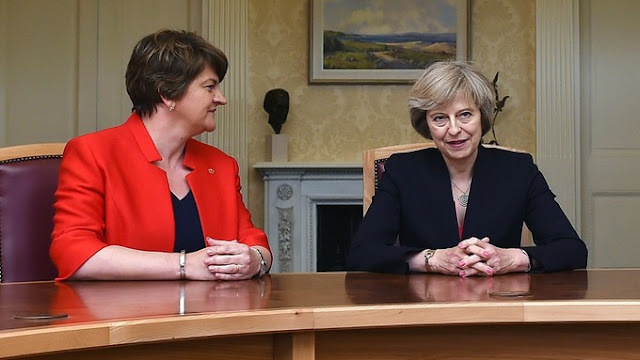 The DUP make the Tories look like fairy godmothers. Thread: T May will form a gvt with 318 Tories and 10 DUP - an effective majority of 10. The Northern Irish assembly has spent much of this year in disarray due to a collapse of its dissolved government, triggered by the resignation of former Sinn Féin leader Martin McGuiness over a DUP overspend. Rightfully so, many question the DUP’s credibility. Memes galore are addressing the difficult position the Queen is being forced into, having to potentially allow a British government with the DUP at the helm. Theresa May’s hypocrisy is being called out. She and her party spent a lot of the campaign attacking Jeremy Corbyn’s ties with the IRA, a terrorist organisation but have now potentially joined ties with the DUP.